You'll be £25.00 closer to your next £10.00 credit when you purchase BET Group Bus Fleets. What's this? 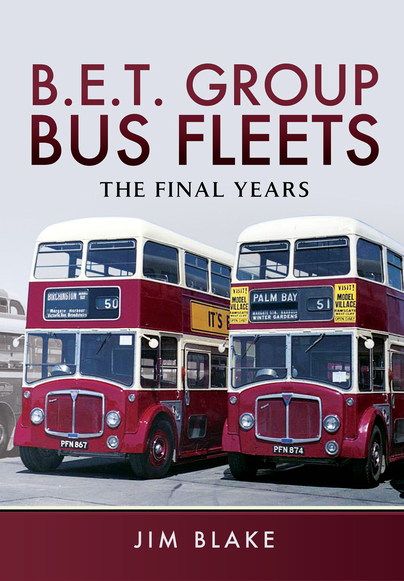 This book looks at the wonderful variety of buses and coaches operated by British Electric Traction group fleets in the 1960s, featuring previously unpublished photographs from Jim Blake's extensive archives. Not only did these fleets, which served most of England and Wales, have a splendid variety of British-built buses and coaches with chassis manufactured by the likes of AEC, Crossley, Daimler, Dennis, Guy and Leyland – with bodywork by such firms as Park Royal, Weymann, Metro-Cammell, East Lancs, Northern Counties, Roe, Duple, Plaxton, Willowbrook and Leyland again – but they also had an array of distinctive liveries. Many dated back to the early part of the century when the operators first started bus operation. The smart maroon and cream of East Kent, the dark green and cream of Maidstone & District or the light green and cream of Southdown, for example, were supplemented by ornate fleet-names, often in gold lettering. These three fleets were just a few of those that served seaside towns, and will remind readers of holidays they spent in the 1950s and '60s. Sadly, the years covered by this book are the final years of the BET group, which was taken over by the nationalised Transport Holding Company in late 1967, as a prelude to the creation of the National Bus Company, under which the distinctive liveries of the BET group fleets, and even some of the operators themselves, would disappear. The 1960s also saw the demise of many traditional types of bus that these fleets operated, owing to the introduction of rear-engined double-deckers, such as the Leyland Atlantean and Daimler Fleetline, as well as the spread of one-man operation. Many of the photographs featured in this book show the older types in their final days – pure nostalgia for the transport enthusiast! Whether you can best recall the urban fleets that took you to work, shopping or school, or on outings to seaside resorts, it is an era now represented by bus preservationists and people like Jim Blake. The author has lovingly compiled 138-pages worth of black and white photographs and captions which will revive thoughts of the bus companies, their vehicles and the areas they served. At two views per A4 page, there is plenty of room for detail. A book full of memories, a song to the diversity and the colour, especially indicated for the lovers of transport. The pictures are presented largely in chronological order, so he takes us around the country and several times to Victoria and Wembley where his [Jim Blake] camera focused on vehicles that ranged from fleet standards to one-offs and other rarities. This is a dream of a title for enthusiasts of bus fleets from the last century - I grew up in rural Gloucestershire, where all of the buses were made by the Bristol Omnibus Company, for obvious reasons, I guess. Jim's book is a celebration of the British Electric Traction Group's fleets of buses and coaches manufactured by some of the greatest names in the automotive industry. A brilliant celebration of bygone days!